My addiction to deal shopping sites is no secret. And I’m sure a lot of you can relate. 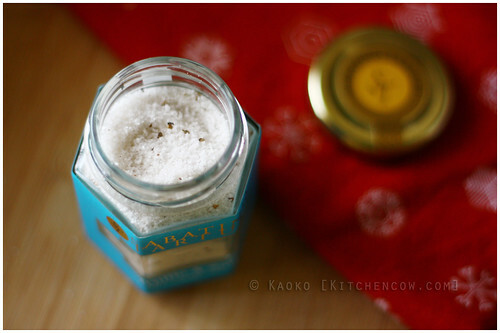 One of my purchases last year was for a bottle of truffle salt from Sabatino Tartufi. It’s not the kind of thing I’d buy off the shelf if I were shopping, say at Santis, mostly because of the price. But staring at it and coming back to stare some more on its deal page had me clicking buy before I knew what I was doing. Sabatino Tartufi’s truffle salt (or truffles & salt as the bottle’s labelled) is a Sicilian sea salt laced with bits of dried summer truffles. This condiment promises to infuse the goodness of truffles into ordinary dishes. At less than a thousand pesos (20 USD) per 3.4 oz bottle, it wasn’t so bad. I mean, truffles! Receiving my parcel excited me more, as the simple act of unwrapping the bottle hit me with a strong whiff of truffle. Opening the actual bottle was like a truffle left hook: potent, deadly, and had me drooling for what was to come. My first attempt to cook with the truffle salt was simple enough. Eggs over easy, with a sprinkling of truffle salt. Simple? Simply wonderful! The hint of truffle intensified the flavor of the egg yolks, adding a pungent earthiness to the rich yolks. I couldn’t stop raving about it… the first time. After days in a row of truffled eggs? Not so much. I tried it with other dishes, but my attempts were probably too complex to let the truffle stand out. Adding more doesn’t work because it can make the dish too salty. I tried it with mashed potatoes and popcorn, but while they were both promising, I made the mistake of having a heavy hand with the salt, making both attempts too salty. Lesson learned, making me look forward to future experiments. 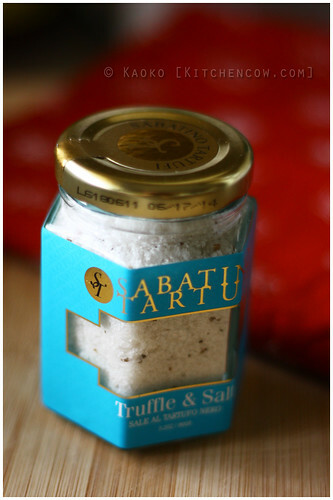 Sabatino Tartufi’s truffle salt is an interesting to have in your pantry. It’s not as versatile as truffle oil, but it’s still a nice thing to have on hand, so I’m not regretting my purchase. At the very least, I can enjoy awesome eggs on demand. Any truffle salt suggestions from you guys? Wow, this sounds interesting! Can you use it like regular salt or may binabagayan lang talaga? May binabagayan. Plus it does squat for dishes that are too strongly flavored. You really need to choose what to use it on to allow the flavors to come out, otherwise, it’s just expensive salt. Haven’t cooked oil-based pasta in a while (I favor ones with lots of fresh tomatoes) but I’ll try it soon. What sort of dip do you recommend, Kate? I this you hit the nail on the head with the eggs…eggs would be one of the best vehicles for this. Try some in a soft scramble…nomnom! I want to try it with that egg with anchovies in a ramekin you posted dati! My dad used to mix this to the food he cooks.